Hopkins High School played host to the 2018 Lake Conference Orchestra Festival on Tuesday, March 6 and Wednesday, March 7, inviting all five conference schools to the main auditorium. 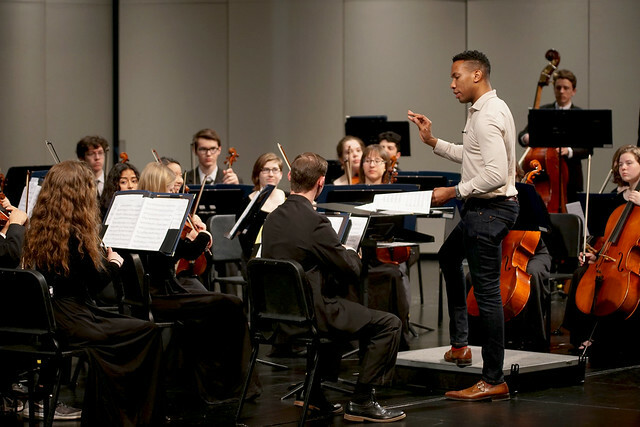 This year, the student musicians had the opportunity to work and perform with Roderick Cox, the associate director of the Minnesota Orchestra. "We usually have college orchestra conductors as our clinicians," Hopkins High School orchestra instructor Alison Swiggum said, "However, this year we were thrilled that Mr. Roderick Cox agreed to work with our students since he is such a high caliber conductor." Over the two days of performances, Hopkins showcased three of the four Hopkins High School orchestra ensembles had the opportunity to participate in the event, the Sinfonia, Chamber, and Philharmonic orchestras.